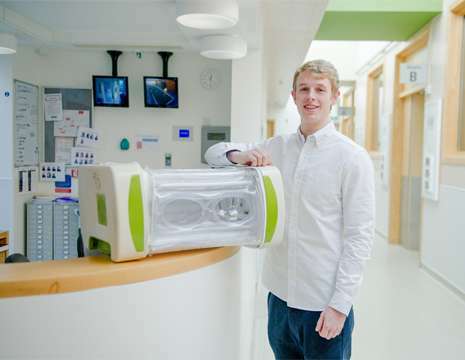 An inflatable baby incubator has won the $45,000 James Dyson award. The inventor said it can match the performance of systems at far higher prices. This is a prototype, designed as an inflatable incubator, called MOM, for infants born prematurely. Loughborough University graduate James Roberts had the developing countries and resource-poor settings in mind when engineering this low-cost device. Roberts said a TV documentary about refugees inspired him to do so. According to a BBC report, "I was watching a Panorama program on BBC about Syrian refugees, and they had a segment about how there are loads of premature kids dying because of the stresses of war and specifically the lack of incubators out there and the infrastructure to support them." His research into current incubators made him see a problem with premature deaths in refugee camps, as he found they were "incredibly expensive" and very large, in turn not able to be transported easily to places that need them the most. He sold his car to fund his first prototype. He was determined to find a more feasible path in such settings. As a more affordable alternative to a $45,000 modern incubation system, he came up with MOM, which costs just $400 to manufacture, test and transport to the desired location. The incubator is blown up manually and it is heated using ceramic heating elements. A screen shows the current temperature and the humidity, which can be custom-set, depending on the gestation age. An alarm will sound if the desired temperature changes. For babies who suffer from jaundice, there is a phototherapy unit. Roberts will continue work on the machine. "I plan to develop the idea further and fine-tune the prototypes, so that the final solution is both as effective and reliable as possible." The machines would be delivered in parts and assembled at their destination. The BBC noted the device was designed for delivery as flat-packed parts. Roberts said the incubator could go in care packages already used for refugee camps. Because the design is modular, damaged parts can be replaced without having to discard the entire unit. The device can run off a battery which lasts 24 hours, in case of power outages. After the child is taken out of the incubator, it can be collapsed and the plastic sheet sterilized so that MOM can be easily transported for re-use elsewhere, said the BBC. Winning the James Dyson Award will provide his team with $45,000 for further prototyping and testing. Loughborough University will also receive $15,000. The award was established to inspire "the next generation of design engineers," and is open to current and recent design engineering students (the Award is only open to students studying or who have studied within four years product design, industrial design, or engineering). According to the World Health Organization, every year, an estimated 15 million babies are born preterm (before 37 completed weeks of gestation), and over 1 million babies die annually from preterm birth complications. Three-quarters of them could be saved with current, cost-effective interventions, even without intensive care facilities. This is 10/10 on scale of awesomeness, respect/kindness to humanity. Sorry for deviating from the scientific comments here - can't you please host on kickstarter/similar - I am 100 percent sure that people would come forward to make sure that this gets funded without delay. I would like to play a part too.